PARIS, France, June 19, 2011 (ENS) – The first transatlantic flight powered by biofuel landed Saturday at Paris-Le Bourget Airport after a seven hour flight from New Jersey. 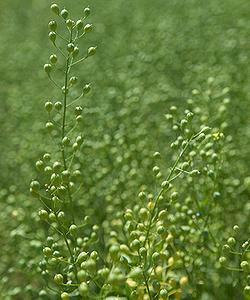 Camelina is a dedicated energy crop that does not compete in the food chain. It grows in rotation with wheat acreage and can also grow on marginal land not suitable for food crops. The feedstock for this flight was grown and harvested by Sustainable Oils, a U.S. producer of camelina-based technology. The flight took off from Morristown, New Jersey, at 9 pm Friday and landed in Paris about seven hours later, at 10 am Paris time. The jet closely followed the route taken by Charles Lindbergh on his first solo nonstop flight across the Atlantic in May 1927. Studies have shown camelina-based jet fuel to reduce carbon emissions from jets by about 80 percent. 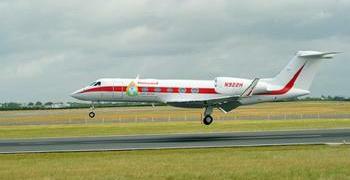 Based on lifecycle analyses, Honeywell calculates that the use of Honeywell Green Jet Fuel on this demonstration flight saved approximately 5.5 metric tonnes of net carbon dioxide emissions compared to the same flight powered entirely by petroleum-based fuel. The biofuel demonstration flight arrived at Paris-Le Bourget Airport in time to be featured at the 49th International Paris Air Show, which opens to the industry on Monday and to the public on June 24. 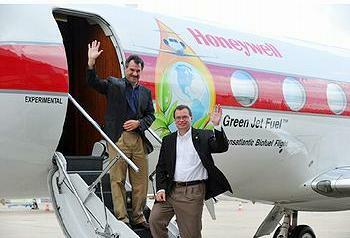 “This first biofuel trip across the Atlantic, along with more than a dozen other commercial and military test flights conducted to date, demonstrates that Honeywell Green Jet Fuel more than meets the demanding requirements for air travel,” said Jim Rekoske, vice president and general manager of Renewable Energy and Chemicals for Honeywell’s UOP, which developed and commercialized the fuel blend. Honeywell has produced more than 700,000 gallons of Honeywell Green Jet Fuel from sustainable, inedible sources such as camelina, jatropha and algae for use in commercial and military testing. In each of the 16 biofuel flights conducted to date, Honeywell Green Jet Fuel proved that it meets all specifications for flight on military and commercial platforms without any modification to the aircraft or engines. The company is proud of its contributions towards reducing the carbon footprint of jet travel. “Reducing both the cost of operations and carbon emissions has never been more imperative. From advanced avionics to sustainable biofuel and energy efficient jet engines, innovations from Honeywell are addressing these needs today,” said Carl Esposito, vice president of strategy and product management for Honeywell Aerospace, who was aboard for the first transatlantic biofuel flight. In addition to biofuels, Honeywell offers other technologies to help airlines reduce fuel costs, the largest single operating cost for airlines. 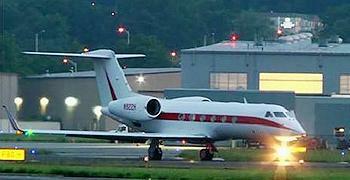 “Honeywell’s Primus Epic navigation and safety technologies embedded in Gulfstream’s PlaneView cockpit helped the aircraft fly the most fuel efficient and direct route from Morristown,” said Esposito. Fluctuating fuel prices combined with increased restrictions in aviation emissions regulations is driving the demand for alternative sources of fuel. In 2007, the 190 member governments of the International Civil Aviation Organization, ICAO, set a global goal of two percent annual fuel efficiency improvement up to the year 2050. The organization also set a global framework for the development and deployment of sustainable alternative fuels for aviation and a target of 2013 for a carbon dioxide standard for aircraft engines. Building on those actions, last October ICAO adopted a resolution to reduce the impact of aviation emissions on climate change, providing a plan of action through 2050. Alongside those global standards, businesses have set voluntary standards for their aviation activities.